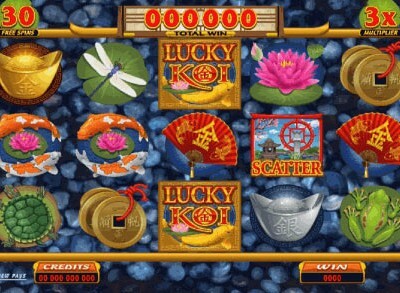 Lucky Koi is a fantastic Asian inspired online pokies game with a similar theme to Australian pokie Sun Choy Poi. Featuring the beautiful and tranquil charm of traditional Japanese koi ponds the game includes brightly coloured images from the koi pond. The game is played out over 5 reels and 25 paylines and includes wild and scatter symbols, two bonus games, and huge linked jackpots. The koi is an Asian ornamental fish, made up of striking colours and patterns and usually depict good luck. When playing you will find red and white koi swimming in a Yin Yang pattern along with other pokie symbols including a frog, the turtle, the dragonfly, and the water lily. Other traditional Japanese culture symbols including a fan, gold and silver teapots, and golden coins. One of the most powerful symbols is the stone lantern scatter symbol that will award you a payout whenever three or more appear on the reels. You will also get access to the Bonus Choice screen where can select between a Free Spins Bonus or the Koi Bonus. Either 10 to 30 free spins can be won with up to 5X multiplier. Alternatively in the Koi Bonus, you are handed a bamboo fishing pole and invited to catch 3 to 6 koi from the pond with each koi providing free credits. If you love Asian inspired online pokies games with oriental themes, then Lucky Koi is one of the best. Play our free demo game or enjoy real money pokies at online casinos.